Pet Vaccinations at All Creatures Veterinary Hospital, Inc.
All Creatures is now offering Canine Influenza Vaccine. Dr. Wise will use Nobivac Canine Flu which provides enhanced responses to both H3N2 and H3N8 strains. The first time your dog receives this vaccine, a booster will be required in 3-4 weeks. After that, the booster will be done once a year. Many boarding kennels are requiring this vaccine to be current as part of your pet's vaccine coverage. Call us for an appointment soon if you are interested in this vaccination for your pets. This disease complex is the most common problem in young kittens and sick cat populations. We can start the protection from this at 8 weeks of age and with monthly boosters through 12 weeks of age, so your kitten will be able to fight this disease complex if exposed. Adult cats need to be boostered annually to maintain good immunity. Even though most indoor cats are healthier, they can become exposed to these respiratory problems through an open screen. Transmission is through direct contact, but also through aerosol (sneezing) contact. FVRCP-C is the vaccine we use and this includes the most common and the most dangerous viral diseases that our cats come in contact with. It can cause permanent eye disease, sinus damage, or even death. Feline leukemia virus can cause cancer in cats! More often, however, it causes the cat's immune system to be wiped out so your cat succumbs to routine infections. It is spread through close contact with infected cats or some kittens can be born with it. It can be tested for by a simple blood test. This test is recommended for sick cats and cats that you adopt and plan to bring into a multi-cat household. A positive test is not an instant death sentence, however, because some cats can clear the virus from their system within 6 to 8 months. Sick cats that test positive are in another disease category and should be treated as if they have a defective immune system. They will need special nursing care and intensive medical management for the rest of their life. Vaccinating properly for this disease is often not done. The timing must be strictly adhered to in order for your cat to build up protective immunity. The first time a cat is vaccinated with feline leukemia vaccine it requires a second booster within 3 to 5 weeks and the cat must be at least 12 weeks old at that last booster. Annual single shot vaccination is continued as the cat's lifestyle dictates. Strictly indoor cats ( they don't even live with cats that go outdoors) do not need annual revaccination nor is it feasible to vaccinate feral cats that you don't plan on recapturing 3 to 5 weeks later for the booster. The reasons for vaccinating for rabies are the same for cats as for dogs, but when you think about it our cats are more likely to be exposed to wildlife reservoirs of the virus. It is not mandated by the law to vaccinate your cat, but it is ridiculous not to. Some people fear that the vaccine will cause a deadly cancer at the site of injection. Those fears are unfounded now since vaccine manufacturers have reformulated their products to eliminate the potential problem. Vaccine induced sarcoma can occur with virtually any vaccine. If you were going to only vaccinate your cat for one thing, this is not the vaccine to leave behind. 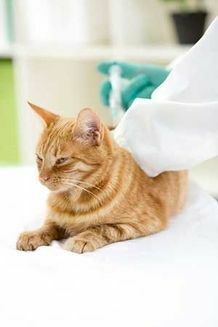 The same laws apply to quarantine and testing for rabies as for dogs if your cat bites someone and does not have proof of vaccination. Vaccination can start at 12 weeks and annual booster follows the first shot with every 3 year vaccination thereafter. Puppies can start their first shot at 8 weeks with a full, detailed physical exam. Subsequent shots are at 30 day intervals and are given by the nurses after a brief exam. The best protection against disease is given by repeated vaccination at 30 day intervals through the 5th month of age. This is when your puppy's immunity is in full swing and ready to protect him. Adult dogs should receive booster vaccinations annually. This is the main vaccine that needs to be on a strict schedule to comply with state and local laws and for a good reason...the disease is 100% fatal. This vaccine can be given as early as 12 weeks of age. The first time your dog gets this vaccine, no matter how old he is, the vaccine must be boostered 1 year later. Subsequent vaccination is at 3 year intervals if not allowed to become over due. Since this disease is transmissable to humans (zoonotic), vaccination also protects you and your family. If your dog happens to bite someone and the rabies vaccination is not current and documentable, then your dog may either be sacrificed and have his brain tested (after being decapitated), or the authorities may decide to quarantine him at your expense for up to 6 months. It is always easier to get vaccinated. The county provides low cost services a couple times a year for this vaccination opportunity. There is no excuse to not vaccinate for this disease! 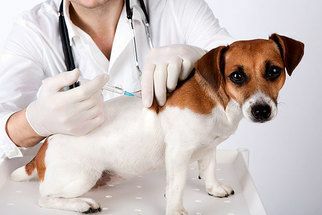 Dogs that are not subsequently vaccinated, but have proof of a blood titer only, will still be considered a nonvaccinate in the eyes of the law. This is the initial vaccine that an 8 week old pup should start off with and it is boostered as needed. The combination of distemper, adenovirus, parvo, parainfluenza, and leptospirosis are considered standard protection against what may lurk in your dog's environment. We recently added the Leptospirosis to the mix due to this disease being spread through water where racoon, deer, skunk, bobcat, coyote, mice, and opossum may live. These can be taylored to meet your pet's individual needs and requirements at shows or boarding facilities. We do see a fair amount of parvovirus in dogs up to 18 months of age so it is important to protect against it. We tend to see more of this disease in Rottweilers and Pit Bulls and in 12-20 week olds that have never been vaccinated. Distemper virus can lead to permanent nervous system damage and or fatal respiratory disease. The other viruses can be debilitating as well and can cost hundreds of dollars to treat. Again, it is easy to vaccinate for and there are low cost alternatives that can help you protect your dog. There is no excuse to not vaccinate your dog for these diseases! This vaccine is administered by oral dropper onto membranes. This method and type of vaccine delivers almost immediate protection against this disease syndrome. Your dog will be able to go to the groomer, dog show, or boarding facility within 24 hours of administration. Rattlesnake, Giardia, Corona, and Lymes are considered non-essential vaccines at this facility and by most veterinarians. As conditions change and or more research qualifies these vaccines, their use will be considered.